Attention should be drawn by officials towards an immediate ban on the import of food crops which can be grown locally without trying to submit consumer reports made according to the needs of various racketeers, President Maithripala Sirisena said. The President made this observation addressing the National Farmer Convention on cultivation of barren paddy fields held at the Magampura Ruhunu International Conference Hall in Hambantota yesterday. “This marked the inaugural programme of a series of countrywide awareness programmes for farmers to induce them to cultivate all barren paddy lands in order to fulfill national development targets,” the President said. Referring to the Ginganga and Nilwala projects, the President said the government may be forced to launch fresh investigations into alleged acts of fraud and corruption that occurred during their implementation. This has to be done taking into cognizance the inordinate delay in the ongoing investigations into these projects. However, he had to emphasise to members of the government on whom the responsibility had been cast to implement these projects that they should endeavour to accomplish these tasks by safeguarding political values. “The government subscribed to the view that the Ginganga-Nilwala project was quintessential for a new chapter in the development of the Hambantota and Matara district as expected by the farmers in these two districts,” the President said. The President also explained in detail the programme of work undertaken by the government to create a re-awakening in the agriculture sector and uplift the farmer economy. 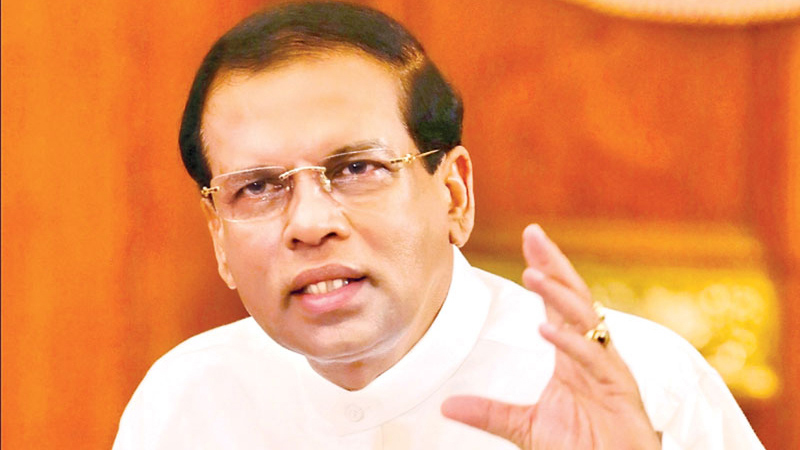 President Maithripala Sirisena said SriLankan Airlines served him cashew nuts while travelling from Kathmandu to Colombo via New Delhi but he simply could not eat the poor quality cashew. He said that neither a human being nor a dog will eat these cashew nuts. “Who authorised the purchase of these cashew nuts for SriLankan Airlines? the asked. A memorandum containing farmers’ problems and grievances was also handed over to the President at this meeting. Minister Mahinda Amaraweera, Deputy Minister Lasantha Alagiyawanne and Provincial Agriculture Minister U.G.D. Ariyatilleke were also present on the occasion. The President also opened a new three storey building of the Ambalantota Divisional Secretariat built at a cost of Rs.99 million by unveiling a plaque. The President later inspected the building. Several other programmes were also held to coincide with this event. These included the handing over of land title deeds to people in the area, equipment to disabled persons, scholarship grants to schoolchildren and service appreciation awards to agriculture officers in the Hambantota district. Minister Vajira Abeywardena, Home Affairs Ministry Secretary S.T. Kodikara Hambantota GA M.K. Harischandra and several government and opposition politicians were also present on the occasion.